Plant phytophenols especially condensed tannins (CT) and saponins (SP) have been demonstrated to impact on rumen fermentation. Dragon fruit (Hylocereus undatus) peel powder (DFPP) contains both CT and SP. The current study aimed to investigate the influence of DFPP and varying levels of concentrate and roughage ratios on gas production kinetics, nutrient degradability, and methane production “using in vitro gas production technique.” The dietary treatments were arranged according to a 3 × 5 Factorial arrangement in a completely randomized design. The two experimental factors consisted of the roughage to concentrate (R:C) ratio (100:0, 70:30, and 30:70) and the levels of DFPP supplementation (0, 1, 2, 3, and 4% of the substrate) on DM basis. The results revealed that the R:C ratio at 30:70 had the highest cumulative gas production when compared to other ratios (P < 0.01). The in vitro true dry matter degradability at 12 and 24 h was affected by R:C ratio (P < 0.01). Furthermore, volatile fatty acids (VFA) and propionate (C3) were significantly increased by the levels of DFPP, while acetate (C2) and C2:C3 ratios were decreased (P < 0.05). The rumen protozoal population was significantly decreased by DFPP supplementation (P < 0.05). Rumen methane production was significantly impacted by R:C ratios and decreased when the level of DFPP increased (P < 0.01), while NH3-N and ruminal pH were not influenced by the DFPP supplement. It could be summarized that supplementation of DFPP resulted in improved rumen fermentation kinetics and could be used as a dietary source to mitigate rumen methane production, hence reducing greenhouse gas production. 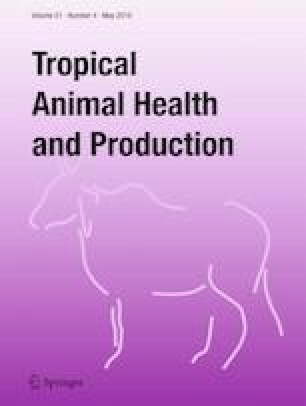 The authors would like to express our sincere thanks to Tropical Feed Resources Research and Development Center (TROFREC), Department of Animal Science, Faculty of Agriculture, Khon Kaen University, Thailand, the Thailand Research Fund (TRF) through the International Research Network (IRN) program (TRF-IRN57W0002) and TRF-IRG5980010 for their kind financial support and the use of research facilities. The Post-Doctoral Training Program from Research Affairs and Graduate School, Khon Kaen University, Thailand (grant no. 58440) is also acknowledged. Many thanks are also extended to all graduate students under TROFREC.